Not sure if this is a cookie jar or the cannister in the hearts delight collection. 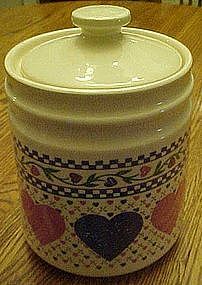 pretty ceramic cookie jar that has calico hearts background and large hearts with a top border of vines and hearts. Perfect condition. Measures 6 3/4" tall plus lid.